After two years of winning the inaugural Asia’s MasterChef, lawyer-turned-chef Woo Wai Leong has finally opened his own restaurant, Restaurant Ibid at Boat Quay, serving Nanyang-styled cuisine. What is Nanyang-styled cuisine? Fine-dining scene using Singapore food as a starting point has gone primarily in two directions: modern Peranakan (like Candlenut) or mod sin which plays with classic hawker dishes and presenting them in new, refreshing, expensive ways (Restaurant Labyrinth and Wild Rocket). 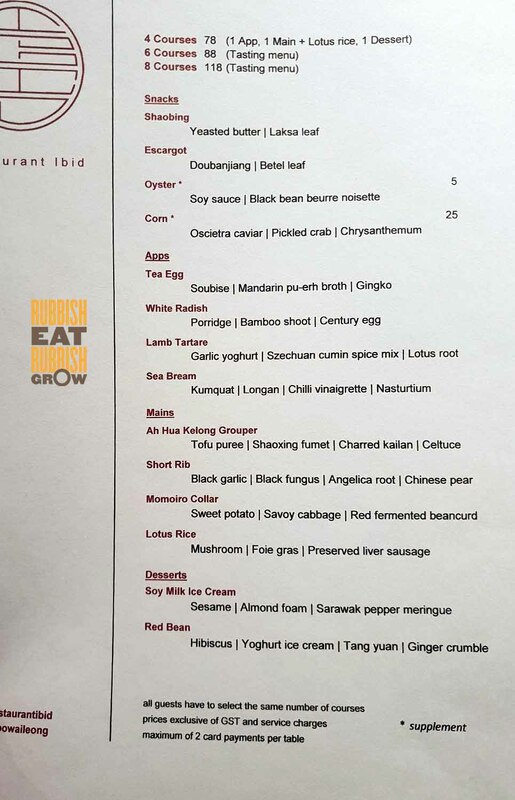 Woo has created a third way: modernising classic Chinese cuisine–that is dishes from China where 75% of our population originated from–using Southeast Asian influences and Western cooking methods. The restaurant’s name, “Ibid,” which means “from the same source,” now makes sense. Maybe one day Woo will open an African restaurant because we were all from Africa, right? For dinner, it’s $78 for four courses; $88 for 6 courses; and $118 for 8. The portions are quite small, so definitely go for the 8-course dinner. We tried 11 dishes–too many to go into each one in detail–and will talk about what works and what doesn’t. But in general, each dish consists of many ingredients that are paired immaculately and each ingredient takes a long, meticulous cooking process. Bad things first: In general, I think the appetisers are too complicated and as a result, they can be confusing. For example, the skewered escargot is first brushed with dou ban jiang and grilled over charcoal, and then brushed with dou ban jiang mayo again, and dipped in bawang goreng (fried shallots), wrapped in betel, and grilled again. I thought there are too many flavours fighting for attention and not enough texture here. Some concepts don’t work very well too. For instance, the short rib (pictured above) is sous vide on high heat for 48 hours to achieve the texture of braising of braising. It taste really Asian with pickled black fungus… but I keep thinking it as a steak dish. It is presented to be an Asian dish and should be judged as an Asian dish, of course, but one cannot help to compare this to the Western equivalent of the steak dish, and it lacks the simplicity and boldness of the Western steak. However, the complicated way of cooking works well for what we would consider as “mains” in the Chinese cuisine. For instance, the white radish porridge comprises of white radish boiled till soft and cooked in a thermomix with overnight rice and soy milk; finished with butter and salt. There are thin strips of radish, which are pickled to taste like cai po (preserved radish). The yolk of the century egg is dehydrated, becoming a yellow, and coated onto the crispy bamboo shoot. This tastes like breakfast food, and eating breakfast for dinner–what a rebel. If you haven’t tried momoiro pork before–and this is the first time I tried it–you have to get this. While I’m not sure if the gastrique (sweet-and-sour French sauce) goes with the pork (the sauce overpowers the pork), the pork itself has an amazing striated texture. Equally as delicious is the local grouper basted in oil with skin-side down: very fresh and has a nice texture. My favourite of all the 11 dishes is the lotus rice. A mix of short grain (Japanese?) rice and glutinous is first steamed with kelp and lotus leaves. In the meanwhile, dried shiitake mushrooms are fried with butter, soy sauce, and garlic; and then the steamed rice is mixed with mushrooms; and together, they are steamed for the second time. A seared foie gras is placed on top of the rice so all the delicious oil goes into the rice. It’s topped with grated preserved Chinese liver sausage. Super tasty. It’s steamed so many times that the rice has the fragrance of lotus leaves, a feat that even most Chinese restaurants cannot master. Also: very smart to use many umami ingredients to really boost the savouriness of the dish. Of the two desserts, the better one is the soy milk ice cream (pictured above), which has no milk and no dairy, and tastes like our beancurd. It has an interesting ingredient, the “cake,” which is also called the “minute sponge;” it’s made by microwaving espuma (foam). I’ve eaten espuma countless of times but I didn’t know it can be microwaved. What an education. On the whole, I’d prefer more texture in each dish, and I’d like them to be pared down to its core elements. I’d also like more unexpected pairing to bring out the unique characteristics and flavour of each ingredient. But as it is, this is a legit first effort by Woo. There is much creativity and hard work and sincerity. Dining here is an education in culinary arts. Everything is good (with an exceptionally delicious lotus rice), and nothing is terrible. It’s a restaurant that shows a lot of promise. “Ibid” may mean “from the same source,” but this restaurant also insists on our differences from our Chinese roots, displaying proudly our unique identity as Singaporeans.